Commemorates the attempted martyrdom of Saint John the Apostle in 95. John was bound and brought to Rome, Italy from Ephesus by the order of Domitian; the Senate condemned him to be taken to the Latin Gate and thrown in a cauldron of boiling oil. John stepped out of the cauldron without injury, and instead was exiled to Patmos. One of six children born to the wealthy, pious family of Francesco Benedetta and Adelaide Campanella Benedetta. Baptized the day after her birth, and confirmed at age 12. Educated at home, she was familiar with the politics and anti-clerical arguments of her day. Married to Gerolamo Custo on 5 November 1852. The couple first moved to Marseilles, France, but financial difficulties forced them to return to Genoa, Italy. Their oldest child was rendered deaf and mute by illness. Gerolamo died of natural causes on 9 March 1858, leaving Rose Maria a widow with three children; the youngest died a few months later of natural causes. While these miseries may have caused some to become angry with God, Rose Maria instead took them as a lesson, and an indication of vocation - she knew pain, poverty and trial, and was thus qualified to work with others experiencing them. Though she continued to provide for her children, she took private vows of chastity and obedience in 1858, a vow of poverty in 1861, and became a Franciscan tertiary. In 1862 she received the hidden stigmata. Though she preferred silence and solitude, Catholic associations in Genoa began soliciting her help. 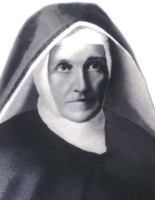 President of the Pious Union of the New Ursuline Daughters of Holy Mary Immaculate, and revised its Rule. While working on it, she received a call to form her own congregation. Though she was encouraged by everyone, including the archbishop of Genoa, but she hesitated, fearing it would take her away from her children. She approached Pope Pius IX about it on 3 January 1866, hoping he would discourage the idea; he told her to begin work on it immediately. With Father Giovannio Battista Tornatore, she co-founded the Institute of the Daughters of Saint Anne, Mother of Mary Immaculate in Piacenza, Italy on 8 December 1866 with a mandate to work with the poor and sick. She took the habit of the Institute on 26 July 1867, and on 8 April 1870 she and twelve sisters made their solemn profession, during which she took the name Anna Rosa. The Institute received official approval in 1879, and its rule was approved in 1892. She worked with Blessed John Baptist Scalabrini. By Anna Rosa's death there were 368 houses in Italy, Bolivia, Brazil, Chile, Peru, and Eritrea, they had built hostels, schools and kindergartens, had 3,500 sisters, and worked in a ministry to the deaf and mute. Today they are associated with the Movement of Hope, the Contemplative Order of the Daughters of Saint Anne, and the Sons of Saint Anne. Third son of Hughes de Laval, an aristocrat soldier, and Michelle de Péricard. His was an old, distinguished and religious family, and Francis early felt a call to the priesthood. Educated by Jesuits at La Fleche from ages eight to fourteen. His father died when the boy was thirteen, and as clerical positions were often as much politics as religion, Francis was made a parish canon so that his salary could help support the family. Studied for the priesthood at the Jesuit Clermont College in Paris, France at age nineteen, but withdrew for a while in 1645 when his two older brothers died and he was forced to manage the family estates. Ordained on 1 May 1647. Archdeacon of Evreux. Member of the Paris Foreign Mission Society at age thirty. Vicar apostolic of Tongkin, Indochina (modern Vietnam) in 1653, but family obligations and the turmoil of the region prevented him moving there. Resigned his position in 1654 to spend four years in a hermitage in Caen. Titular bishop of Petraea. Appointed vicar apostolic of New France (modern Canada) by Pope Alexander VII in 1658. Consecrated as bishop on 8 December 1658. Arrived in Quebec City, population 500, to take up his new duties on 16 June 1659. His territory covered all of Canada and the central section of what would become the United States. It was an enormous frontier diocese in need of administration, stability, and evangelization, and Francis approached it as spiritual work. He promoted missionary work, and supported missionaries from the Jesuits and Recollect Franciscans. Restored the shrine of Saint Anne de Beaupré, and built the cathedral of the Immaculate Conception. Founded the seminary of Quebec in 1663, and started the Catholic school system throughout Canada. Quebec was established as a diocese in 1674, and Laval consecrated its first bishop. Fought the alcohol trade to the Indian tribes, had it outlawed within his territory, and excommunicated those who dealt in it. His work slowed the trade and improved the lives of the natives, but made him many enemies within the liquor trade. In 1684 he went into retirement, becoming a hermit at the seminary in Quebec, hoping to live out his life in prayer. However, disastrous fires in November 1701 and October 1705 brought him out of retirement to oversee needed re-construction, he was ever involved in charitable work for the poor, and available to consult with his successor. Laval University in Quebec is named for him. Third of four children born to Tommaso Troiani and Teresa Panici, her mother died when the Maria was six. Franciscan tertiary, dedicated to the teachings of Saint Francis, and to the care and education of girls. Franciscan nun, taking the habit on 8 December 1829, and taking the name Sister Maria Teresa of Saint Rose in honour of Saint Rose of Viterbo. Missionary to north Africa. In 1852 the Apostolic Vicar of Egypt requested a Franciscan school for poor girls be established in Cairo; Maria and four other sisters met with Pope Pius IX on 4 September 1859 to offer their service, and he gave them his blessing. The sisters and Father Giuseppe Moden arrived in Cairo on 14 September 1859 to begin their work. On 5 July 1868, the group received approval as a formal congregation under the name Third Order Franciscan Sisters of Cairo; they were later renamed the Franciscan Missionary Sisters of Egypt, and in 1950 were renamed the Franciscan Missionaries of the Immaculate Heart of Mary. From the day of their founding until the day of her death, Sister Maria served as Mother Superior to the group. Pope Leo XIII always held her in high regard. Born to the wealthy Tuscan nobility. Married and the father of four. Noted for his charity to the poor, especially in times of famine. 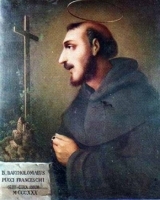 In 1290, when his children were grown, Bartolomeo left his wealth and family to become a Franciscan friar at the convent of San Francisco in Montepulciano, Italy. Many of the locals considered him insane to give up the one social position for the other, but he was a model of religious devotion. Priest. Received visions of Mary and the angels, and was known as a miracle worker. Son of Ambrose Middleton of Barnard Castle, Durham, England, and Cecil, daughter of Anthony Crackenthorpe of Howgill Castle, Westmoreland, England. Entered the English College at Rheims, France on 9 January 1582. Ordained on 30 May 1586. Returned to England to minister to covert Catholics in the area of London. Arrested for the crime of priesthood; captured in a residence in Clerkenwell, London by a priest-catcher who claimed to be a Catholic who needed a priest. Martyr. Raised as an Anglican, he converted to Catholicism and was received into the Church at the English College in Rheims, France in 1587. Ordained in 1588. Returned to England to minister to covert Catholics. Arrested in 1590 in a grocer's in Fleet Street in London, England by a priest-catcher who pretended to be a Catholic in need of a priest. Imprisoned and tortured in the Tower of London, he admitted to being a priest. At his trial for the crime of priesthood, he argued that his confession was obtained by torture and thus not legally sufficient to condemn him. The court complimented him on his arguments and his court-room demeanor, then condemned to death and had him immediately executed. Martyr. Monk of Lindisfarne Abbey. Noted for his personal sanctity, his extensive Bible knowledge, and his charity to the poor; he annually gave away a tenth of his goods and property. Bishop of Lindisfarne, England for eleven years; successor to Saint Cuthbert. Even as bishop he would make two 40-day retreats each year to live as a hermit in meditation. Built several churches in the region, and improved the structures at Lindisfarne. Bede wrote about him. Benedictine monk at Brescia, Italy. Abbot. On assignment from Pope Gregory II in 717, he re-built, re-staffed and re-invigorated the monastery at Monte Cassino, Italy following the Lombard invasions that had left the place damaged and deserted. He served as abbot there, and by the time of his death, the abandoned structure was a center for learning and holiness again. Spiritual teacher of Saint Willibald and Saint Sturmius of Fulda. Priest. Rector of the major seminary of Wloclawek, Poland. Arrested in 1939 during the Nazi persecutions, he kept his faith and ministered to other prisoners in the camps. Deacon in the same church as Saint Marianus, and imprisoned with him at Cirta (modern Constantine, Algeria) in the persecutions of Valerian. Tortured over several days to force him from his faith. During this torment he had a dream that showed him final triumph. Martyred with hundreds of others. His story was recorded by a fellow prisoner who was not killed. Friend of Saint Paulinus of Nola, Saint Delphinus of Bordeaux, and Saint Chromatius of Aquileia. Ordained as a deacon by Saint Ambrose of Milan. Second bishop of Milan c.400. Supported the Council of Carthage in 401. Supported Saint John Chrysostom in his disputes. Priest. Arrested in 1939 during the Nazi persecutions, he kept his faith and ministered to other prisoners in the camps. Traditionally one of the 72 disciples commissioned by Jesus. Priest. Bishop of Antioch, probably ordained by Saint Peter the Apostle. The first person known to use the word Christian in his writings. Worked with Saint Ignatius of Antioch. Martyr. 7th-century professor and prayerful poet in Cork, Ireland. Led his students on a pilgrimage to a small island to save them from plague that ravaged Ireland in 664. Nun in 6th century Rome, Italy. Friend of Saint Galla who had founded their monastery. She received a vision of Saint Peter the Apostle warning her of her death. Mercedarian friar at the convent of San Michele del Monte in Zaragoza, Spain. Worked with Blessed William Tani to free 212 Christians enslaved by Muslim invaders in Granada, Spain. Missionary preacher in Granada. Mercedarian friar at the convent of San Michele del Monte in Zaragoza, Spain. Worked with Blessed Peter de Tornamira to free 212 Christians enslaved by Muslim invaders in Granada, Spain. Missionary preacher in Granada. Augustinian nun in Milan, Italy. Founded an Augustinian convent in Como, Italy, and served as its abbess. First bishop of Cyrene, Libya. He is mentioned by Saint Luke the Apostle in the Acts of the Apostles. Martyred with 75 other Christians in the perscutions of Diocletian. Fourth century priest. Exiled by the Arian Emperor Valens, he was recalled under Emperor Theodosius. Bishop of Carrhae, Syria. Bishop of Kyrenia, Cyprus. Imprisoned, tortured and executed in the persecutions of Licinius. Martyr. Listed in the Martyrologies of Tallagh and Donegal, but no details of his life have survived. 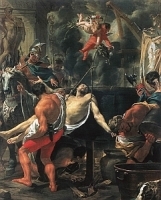 Martyr in Milan, Italy in the persecutions of Diocletian.